Buffet Breakfast served @ The Kitchens 7:30 a.m. - 9:30 a.m.
Buffet Lunch served @ The Kitchens 11:30 a.m. - 1:30 p.m.
Staff Excellence and Team Impact Award Presentation 9:00 a.m. - 10:00 a.m.
RSVP required by May 19, 2017 through Eventbrite (check your SSU email for invitation to confirm your attendance. 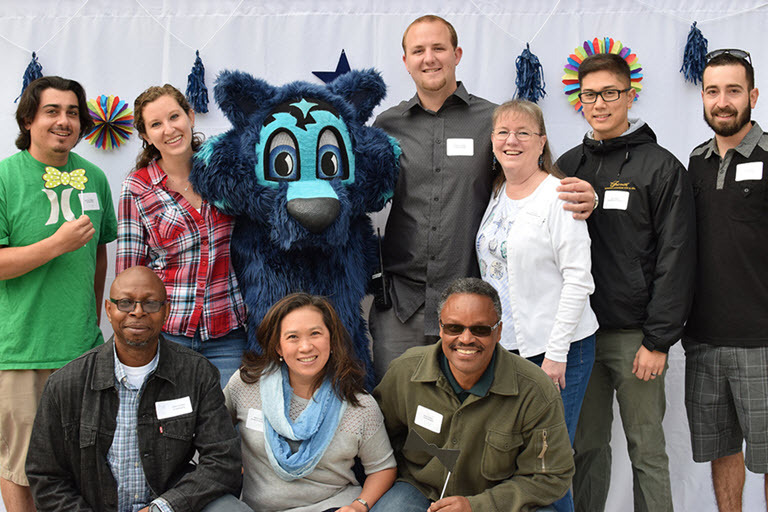 Don't miss this opportunity to have your picture taken with Sonoma State University’s mascot! The theme is “Perfect Pairings" - as they say, good things come in pairs! Some ideas include food, fun, and friends or anything in pairs! Look through your photos to find some paired possibilities to share! All photos submitted will be on display in The Kitchens. For additional entry details please view the 2017 Photo Contest Flyer (pdf). The deadline to submit photos to hr@sonoma.edu is Friday, May 19, 2017. Sessions will be offered at 10:30 a.m. and 2:00 p.m., with sign-ups starting at 8:00 a.m. inside The Kitchens. We have received some great donations for the staff drawing including Sonoma State Hats, T-Shirts, WolfBucks, gift certificates to local merchants (Epicenter,Sonoma Canopy Tours,Swirl Time), a Blu-Ray DVD player, rambler and MORE! NEW THIS YEAR: when completing the required online RSVP, all non-MPP staff will be entered into the door prize drawing. You must RSVP to the event in order to participate in the drawing, as NO drawing tickets will be accepted the day of the event. Is there someone on campus you are dying to show your appreciation to? Stop by the Appreciation Station to create a special Appreciation-Gram for anyone on campus. HR will deliver the Appreciation-Gram(s) on your behalf on Friday, May 26, 2017. Supplies will be provided, just bring your creativity! Stop by the table outside The Kitchens in the morning to drop off your books, CD’s, and DVD’s and swap them for something that interests you. All items remaining at the end of the day will be donated to a local community organization!